Quote Reply Topic: Fancy trying a Back-country course instead? If you're interested in taking a course in Whistler we just launched our Intro to Back-country course. It's great value for money & will take your skiing/snowboarding skills to the next level! 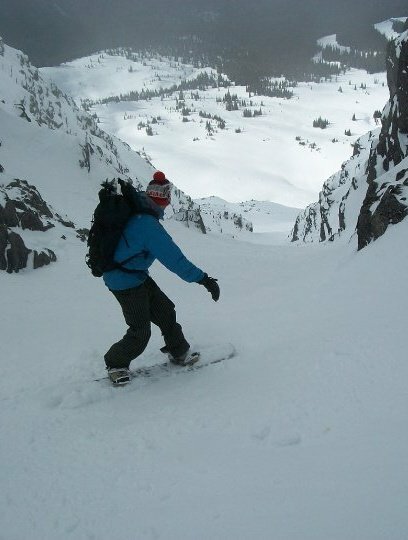 The basic idea is to give you all the knowledge you need to become a competent back-country skier/snowboarder: we teach you avalanche awareness & rescue techniques, navigation & terrain analysis, first aid, trip planning & how to survive a night in the snow. And the best part is that you spend 4 days out in Whistler Blackcomb's back-country shredding the pow with an ACMG certified guide! If you can ride red runs after 4-weeks you're probably a pretty good learner - if you arrive in Whistler in November and get a few weeks practice in you should be fine to take a course like ours. We like people to be able to ski/board down any blue run (we don't have reds in Canada) and be pretty confident at trying black runs... which you should be after a few weeks here! Also I would love to run a girl specific course, so the more girls sign up the better!